The answer (according to the Chronicle) was “B1318 Great North Road Blue House” – the fixed speed camera at the south end of Gosforth High Street. This was activated by speeding vehicles 4,625 times in 2015 – more than any other speed enforcement camera in the entire north east region. It is worth remembering that the police are entitled to prosecute anyone for speeding at any speed in excess of the limit, and that policy and the use of speed cameras can change from year to year, but in 2015 Northumbria Police took action against no more than 0.9%*, or less than one in a hundred, of speeding drivers passing this camera. We can work out how many people were injured in traffic accidents before and after the cameras were installed. 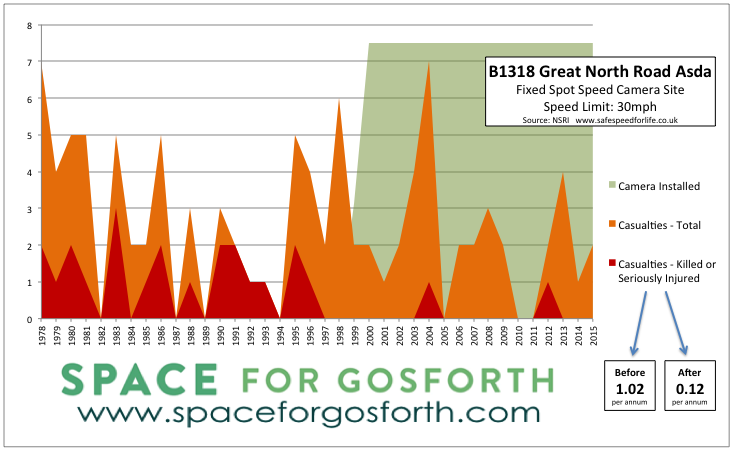 The graph below shows in orange the number of people injured near the Gosforth High Street speed camera site. Injuries that were serious or fatal are shown in red and the green background shows when the camera was operational. Prior to the camera being installed there were on average 0.90 serious or fatal casualties per year (roughly nine every ten years). After installation that average dropped to 0.23. If the same accident rates prior to the camera being installed had continued, there would have been 30 additional casualties of which 10 would have been either serious or fatal and the other 20 considered to be ‘slight’. The impact of the camera installed further north on the Great North Road near Asda has been even greater with a drop from 1.02 serious or fatal injuries per year before the camera was installed to 0.12 afterwards. If the same accident rates prior to this camera being installed had continued, there would have been approximately 11 additional casualties and 12 more of the total would have been either serious or fatal. Together, just for these two cameras, that’s potentially 41 people who have avoided injury, 22 of which would have been serious or potentially fatal. 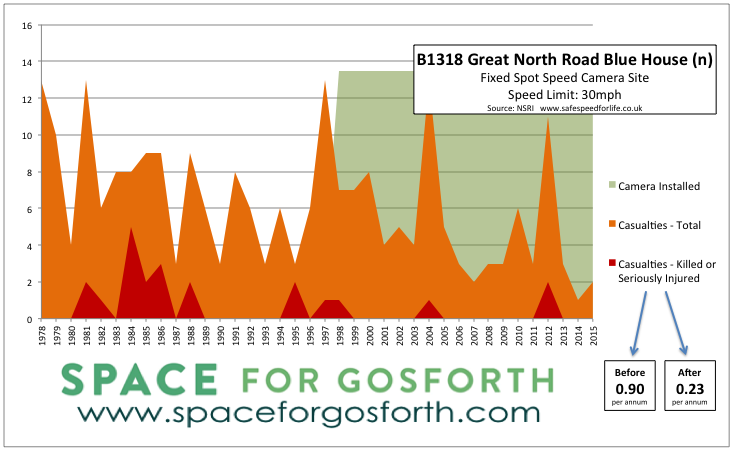 In our article 20 mph – the right speed for Gosforth’s children we shared some data on the increasing likelihood of a pedestrian or cyclist being killed or seriously injured (KSI) as vehicle speeds increase. Even a few miles per hour difference at 30mph could make a significant difference to the chances of someone’s survival, and is negligible in terms of time saved on a journey. On their website NSRI, who provided this data, answer many questions about the effects of speeding. The numbers are chilling. For example, in answer to “Is speed really that much of a problem?” they reply “Between 2010 and 2014, there were 674 people either injured or killed on the roads in the Northumbria police force area where someone involved was exceeding the speed limit”. We think that’s reason enough, with or without the existence of a speed camera and potential fine, for drivers to take extra care not to speed. 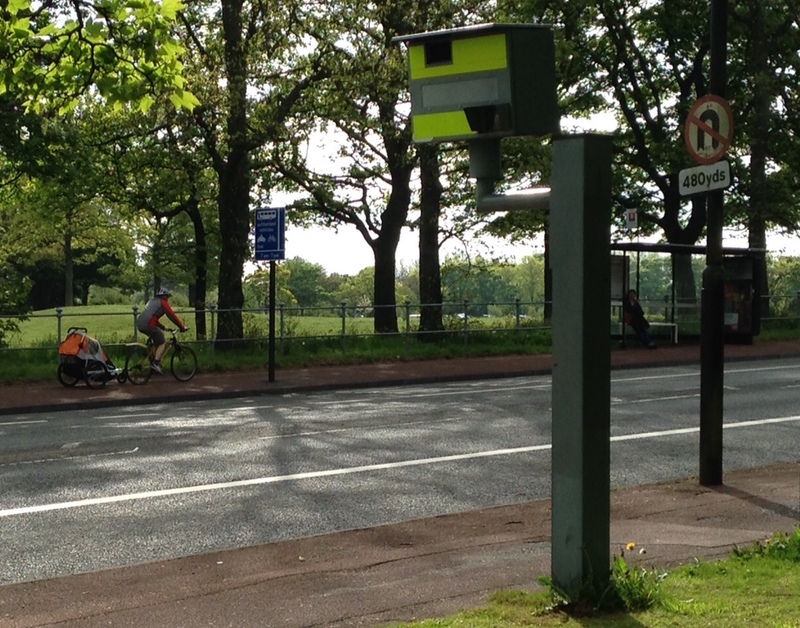 Data on Gosforth’s Speed Cameras is taken from: The Northumbria Safer Roads Initiative. The Site References are ‘141 B1318 Great North Road Blue House (n)’ and ‘142 B1318 Great North Road Asda’. Mobile speed cameras were also used at various locations in Gosforth over 2015. * The figure of 0.9% of speeding drivers is based on 4,625 activations vs 3.2 million vehicles passing the High Street speed camera going north every year, of which roughly 500,000 (half a million) are travelling in excess of the 30mph speed limit.